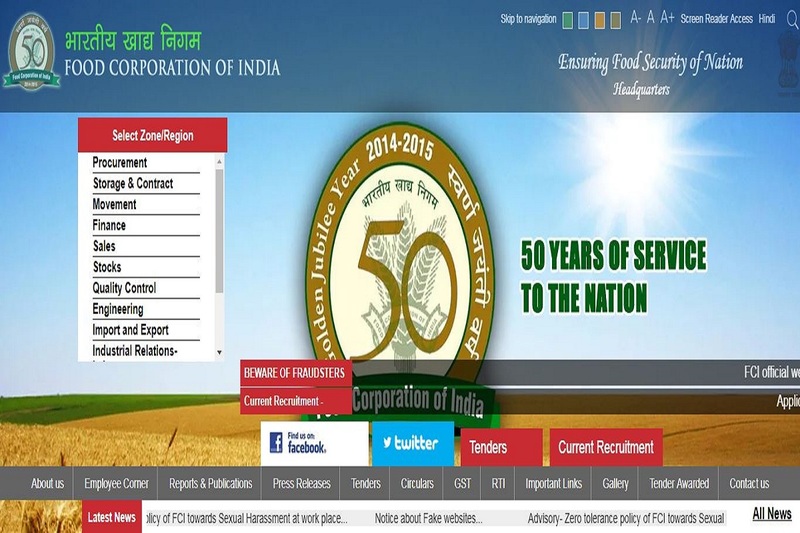 FCI recruitment: The candidates should apply online on the official website by today. FCI recruitment: The application process for 4,103 vacant posts for the Food Corporation of India will conclude today. The online applications were invited for the posts of Junior Engineers, Stenographer, Typist and others. The candidates should apply online by today. • Date of Online Test: Tentatively in the month of March/April/May 2019. • SC / ST / PwBD / Serving Defence Personnel / Ex-Serviceman and Women candidates do not have to pay any application fee. • Interested candidates will be selected on the basis of an online test that will comprise of Phase-I and Phase-II examinations. • The Phase I examination will consist of English language, Reasoning ability and Numerical Aptitude. • The total number of questions will be 100 and the total time duration will be 60 minutes. • All the candidates should check the official notification for academic qualification as they are different for every post. • The age limit differs for every post. However, reserved category candidates will get age relaxation according to the government norms. • Interested candidates should apply online on the official website till March 25, 2019.